Yesterday I go to the batting cage looking for Bruce Bochy to grab him for the pre-game radio show. He’s standing next to Hensley Meulens, the hitting instructor also known as Bam-Bam. It comes out that Hensley, who is from Curacao in the Netherland Antilles, was knighted that morning by the Queen Beatrix of the Netherlands. Bochy and I are appropriately impressed but want to know how he could be knighted without being there with the queen. “Aren’t you supposed to be touched by her sword or something?’’ Bochy asks. Well that’s just perfect. Can’t wait to tell Queen Beatrix! We got to talking about major-leaguers who came from the Netherland Antilles. Everybody I’ve ever met from those islands is an intriguing character. The islands—Curacao, Aruba and Bonaire—are in the Caribbean just off the northern coast of Venezuela so Spanish is a local language. Dutch and English are taught in the schools. Many speak French because of the country’s proximity to French-speaking islands. And the native patois is Papiamento. So Hensley speaks five languages, which is not that uncommon for people there. Players from Curacao are not only different from the average big leaguer but they’re different from the average big leaguer who hails from the Caribbean. I asked Hensley if he had ever been to the Netherlands. He said he had, and we talked a little about how baseball was more popular there than one would think. Which reminded me of a story about Wilhelmus “Win’’ Remmerswaal. He was the first homegrown Dutch player to reach the majors. (Bert Blyleven was born there because his father was in the military, but he learned baseball in the States.) Win was a relief pitcher for Boston in 1979 and 1980. (I was a broadcaster for the Red Sox in 1980 to 1982.) He had a very good arm but grappled with the language, customs and other problems that players from foreign countries often do. And Win was known to close a few bars on occasion (Peter Gammons, who covered the Sox in those days for the Boston Globe, once told me Win’s nickname was “Last Call Remmerswaal”). So the Red Sox are playing the Yankees on a Sunday in late September of the 1980 season. It so happens that the New York Jets of the NFL are playing a home game at Shea that same day at about the same time. Sure enough, after a long Saturday night in the Big Apple, Remmerswaal oversleeps and misses the team bus to Yankee Stadium. He jumps into a taxi and tells the driver to take him to the ballpark. Remmerswall, multilingual much like the Giants Sir Hensley, speaks seven different languages. However, the cab driver speaks one that even he doesn’t know. So, there they are trying to communicate in English, a foreign language for both of them. As they get close to the stadium they end up in this huge traffic jam of people going to the game, and Remmerswaal is getting very anxious and upset. At long last he arrives at the park but can’t find any of his Red Sox teammates because he’s been taken to Shea Stadium for the Jets NFL game! At least he was in time for that game. I don’t believe he showed up at Yankee Stadium until about the 4th or 5th inning. He did not last much longer with the Red Sox. Far from the long ago misadventures of Win Remmerswaal, Meulens is a beloved ambassador for baseball in his native Curacao and a citizen in such high standing that he has now been knighted by Queen Beatrix herself for his considerable success in his career and his many contributions to the citizens of his native land. So happy to see that you’re sharing even more stories via blogging. Looking forward to more. Loved the ‘wrong stadium’ story. No KNBR where I live, I’m not getting enough Jon Miller,.. this is going to be awesome. What’s with the Kuip? During the post-game show in the KNBR booth he looks like either his bladder his bothering him or he wants to go home and hit the sofa or the sack! I for one enjoys everyone’s insights after the game. Is Booth blogging legal in California. What is booth blogging anyway? Hi Jon, Do you think Lincecum should gain back some weight? Jon, For the Saturday day game with the Cards, I think three strikeouts looking ought to be called a “siesta sombrero”. Jon Miller is in his 16th season in the Giants broadcast booth. 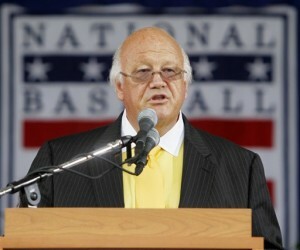 He received the Ford C. Frick Award from the Baseball Hall of Fame in 2010.